We oppose the CCSSI because it continues the failed education reforms of the past and violates privacy rights as it builds a system for centrally managed student training for the future workforce of the “Global Economy.” This central goal will dismantle liberal arts education, which most contributes to the development of mature thinkers who are prepared to thrive in any chosen life path and sustain a free civilization. 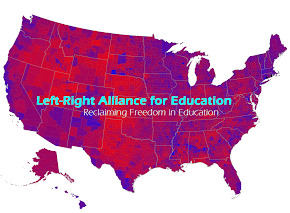 “The Left-Right Alliance for Education” was formed to bring together education reform advocates from across the political spectrum, and across the nation, to determine if it is possible to form a multi-partisan alliance for countering the current federal/corporate alliance driving education reform policy. The participants in the efforts of the Left/Right Alliance for Education understood on a basic level that to be successful in countering the CCSSI we needed to, 1) set aside those points of opposition that are highly partisan, 2) create a clear and succinct message of mutual opposition to Common Core, 3) make it clear that these points of opposition are shared by people from all over the political spectrum, and 4) appeal to the universal desire that all parents have for their children’s education, which is not just to be “career-ready”, but more importantly to become mature thinkers who are highly-motivated, self-disciplined, hard-working, creative, ambitious, happy individuals who know their own minds and who are prepared to thrive in any life path they choose. The Common Core a Initiative will extend and build on the failed education policies of No Child Left Behind. As an experienced, highly qualified educator I oppose attempts to standardize our children with an outdated method of consequential accountability that perpetuates a culture of failure. I fully support your message and understand the importance of a collaborative voice in this effort. The desire to protect our children's education and future is not a partisan, party line issue. Education must remain local with parents, school boards, and teachers remaining the primary drivers for educational improvement. The future of our country and families is literally at stake. Working together to defeat Common Core is the best solution. For this reason, we support Left-Right Alliance for Education. Utahns Against Common Core gladly endorses the statement by the Left-Right Coalition and recognizes that resolving these 3 issues is vital to restoring local control of education and the proper role of an education system. "We oppose the CCSSI because it continues the failed education reforms of the past and violates privacy rights as it builds a system for centrally managed student training for the future workforce of the “Global Economy.” This central goal will dismantle liberal arts education, which most contributes to the development of mature thinkers who are prepared to thrive in any chosen life path and sustain a free civilization. We oppose the philosophy of standardization built into all federal education initiatives, including the Common Core State Standards Initiative. We oppose a national student data system"
Our Facebook page is "Stop Common Core in New York State"
We support the multi-partisan statement of opposition to the CCSSI as stated by the Left-Right Alliance for Education. Thank you for your website. I have always said this is not a left or right issue. It is not a Democrat or Republican issue. It is a propoganda vs. truth issue. As Director of Alabamians United for Excellence in Education, I stand with you. Thank you from the bottom of my heart for starting this group. We need this to show as I have stated from the very beginning, it is not a Right or a Left thing, but a final push to "dumb down" our children to be nothing but followers in "brown shirts'! CCSSI has gathered support from those who will make money off of our children and through the back door process give total control of the education of our children to the Federal government. The Constitution does not even mention education. The Founders felt strongly that the education of our children should be the responsibility and control of and by the parents. Educations primary intent was to teach our children how to read and their main book was to be the bible. Please let me know if our group can be of help and please let me know how we can take part in your list of bloggers. Floridians Against Common Core Education F.A.C.C.E. In the struggle to return our kids' education to the true stakeholders (rather than shareholders) we can expect no less than the end of partisan divisiveness, which is solely kept alive by the corporate media attempting to distract our eyes from their crimes. It's time we take a step back, look at each other through new eyes, and realize that we are not as different as we've been told to be. We all love our kids and want them to grow up in a free, sane, and happy America. I am a Special Education teacher going into my 23rd year of teaching. I have worked in a variety of settings from inclusion to self-contained. The current educational practices of high-stakes testing, one-size-fits-all Common Core Curriculum/ Standards, privatization of schools and teacher/ education bashing is a record low in my career. I have seen many different programs and curriculums come and go over the past 23 years, this is by far the worst way to go about educating children. I want to do what is right for my students and my own daughter and CC and all that it brings with it are NOT the answer.